Once upon a time, there was a beautiful journaling Bible that ached to be created in. It longed for its lovely pages to be drawn and lettered upon but sadly, this beautiful Bible’s master was paralyzed by fear: She lacked confidence in her artistic abilities and feared ruining the pages of her beautiful journaling Bible. And so, the beautiful journaling Bible sat despairing, untouched and unread, upon the shelf of loneliness. Until one day, a magical collection entered the land. To pen and draw the thoughts of your heart! The magical collection that came to rescue the beautiful journaling Bible from the shelf of loneliness had a noble desire: to help the master’s eyes to be enlightened by God’s Word through the art of journaling. And the magical collection’s name was the Illuminated Collection! With him he brought printable downloads that would help the beautiful journaling Bible’s master practice hand lettering, topical templates that the master could trace and use to build her faith, and over 60 lovely doodles for the master to copy into her beautiful journaling Bible. He even brought a limited membership Facebook group where the master could receive weekly instruction in the art of Bible journaling. No longer did the master have to fear ruining the pages of her beautiful journaling Bible. Once again, they were reunited and they created glorious art together that pleased the King of the land…all thanks to the noble Illuminated Collection’s help. Oh, the heroic tale of the Illuminated Collection! Wasn’t it heart-wrenching to read how the beautiful journaling Bible was placed on the shelf of lonliness due to fear? I shed a tear! How gallant was the Illuminated Collection who came to the rescue and brought helpful printables for the master! My favorite part was when the beautiful journaling Bible and the master were reunited for artistic harmony. ^^^^^^^^I hope you see my silly sarcasm! You may be wondering why I wrote this little story: I wanted to creatively illustrate why I designed the Illuminated Collection and what it is all about. 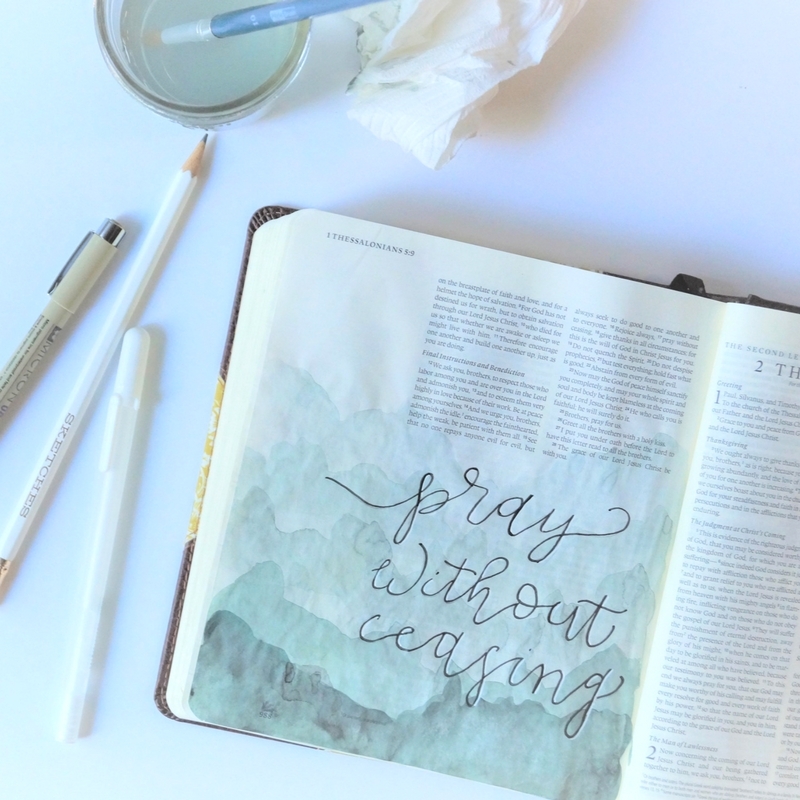 For a long time, I’ve heard from you Bible journaling beauties that you need help creating art in your journaling Bibles. While videos are great, you need the freedom to make your quiet time your own and yet have artistic guides so that you are not overwhelmed by the blank space of your margins. 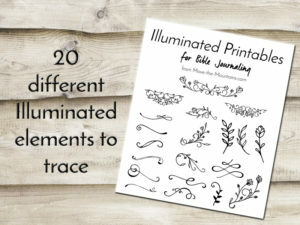 Enter the Illuminated Collection: a new selection of downloads that are easy-to-print that help you develop your hand lettering skills, as well as full templates and fun doodles that you can trace in your margins. These doodles, templates, and worksheets are designed by yours truly. 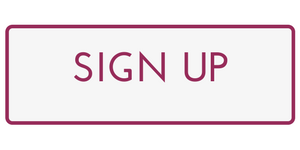 There are 4 themes for the templates, 4 themes for the doodles, and 4 font styles for the hand lettering practice worksheets. But that is not all that is coming out with the Illuminated Collection: I am also debuting the Illuminated Art Journaling Bible that I talked about back in April! I’ve been excited about this journaling Bible for a long time and so I even created a printable download that mirrors the art that is already in this Bible! It is the Illuminated Printable, if you want to check it out! 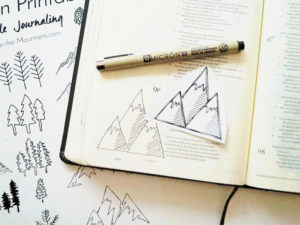 I’ve been having a ton of fun using these new printables in my own journaling Bible and I’ve even used them to Bible journal with my 5 year old! 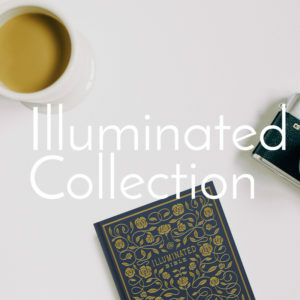 I am so excited to launch this new Illuminated Collection to you, my Bible journaling beauties, because I think it is going to meet the needs you’ve been expressing to me! I hope that this “heroic” collection helps you get over the fear that keeps you from Bible journaling and empowers you to dive into God’s Word artistically! We are so excited too!